Happy February!!! The cold weather is back, y’all. Well.. sort of! The past week was pretty chilly but the high for today is 69. It’s safe to say this was the weirdest January ever, at least here in the south. Anyway, since we found out our closing date a few days ago, house preparations have been taken up a notch and I feel like that has been taking up a major chunk of my time. Our couch and master bed have been ordered, but there is SO much left to do since we are furnishing our townhouse from scratch. I think I’ve looked at pretty much every online furniture store and have visited quite a few stores in the area and am definitely over shopping at this point… but I know it will all be worth it as we watch our home come together! 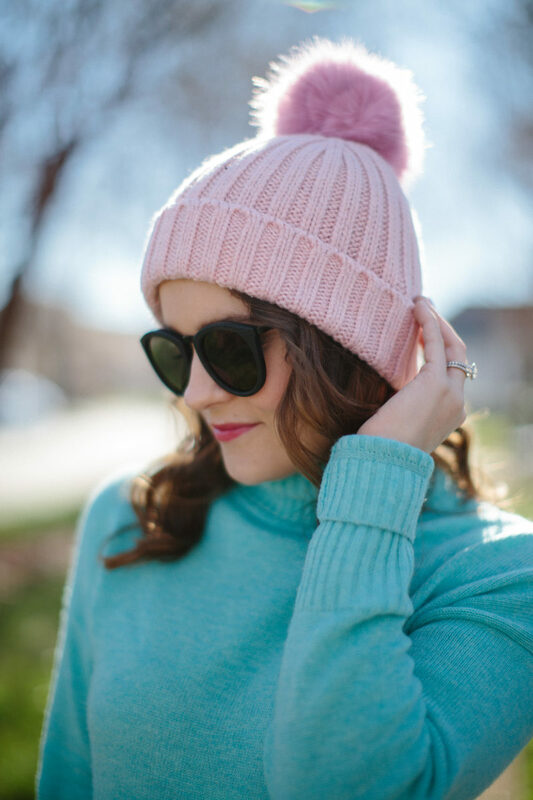 Today I’m sharing a bright & colorful outfit for winter because sometimes it’s easy to get stuck in the black/grey/neutral rut. Spring is just around the corner (kind of!) and I’m ready to bust out the pastels and bright colors, even if it’s in the form of a sweater for now. 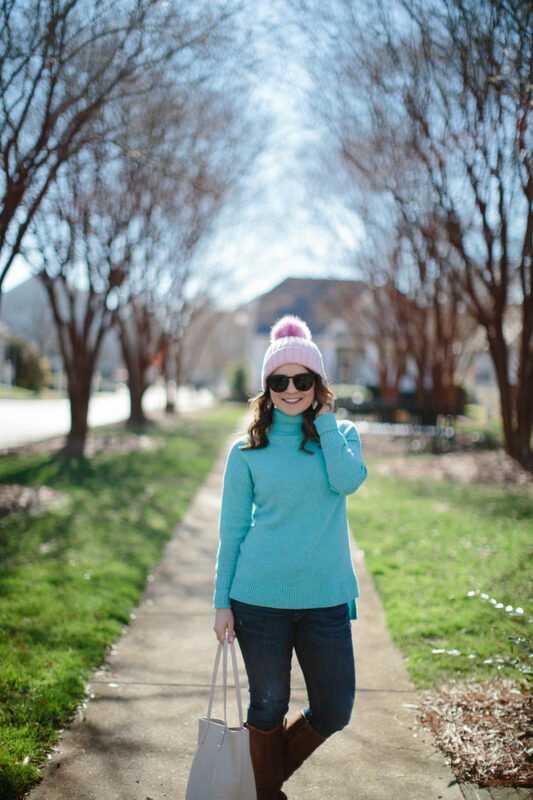 J.Crew always has the best selection of classic sweaters and I love the pop of color in this turtleneck. It’s a wool blend but not itchy at all and I consider it a winter staple in any closet. 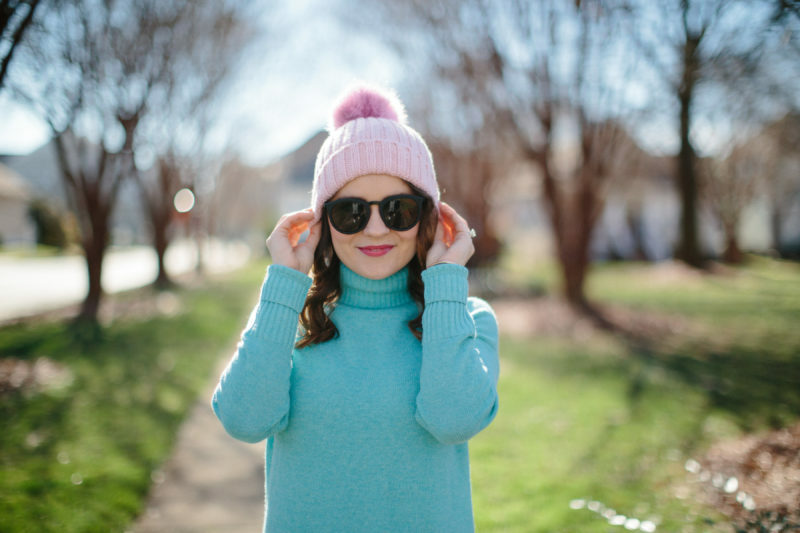 I accessorized with a fun pom pom beanie because ALL beanies should have giant poms on them, am I right?! I also picked up these sunnies the other day and they are super cute and under $80. I love the matte finish and they kind of remind me of the Karen Walker ‘Harvest’ sunglasses, but a little smaller and a whole lot more affordable. So I finally caught up on The Bachelor last night and gahhhh- why do they always leave us hanging like that?! I also JUST found out that Nashville was back on CMT and have some major catching up to do. Like, where have I been?! Oh yea… furniture shopping 24/7. Duh. I’m off today so I’m hoping to squeeze in some shows and hopefully start packing some things up in our place. Hope y’all have a great day and thanks for stopping by! I adore the color of that sweater it’s so pretty! Such pretty colors! It was freezing on Monday and it’s supposed to be 70 today… the struggle of NC. Oh those colors so make me think Spring!! So so pretty and you look adorable in that hat!! I love this bright sweater! It is so fun, especially with that hat! Enjoy these final days before closing even though it’s crazy – a fun crazy! Love these colors all together! 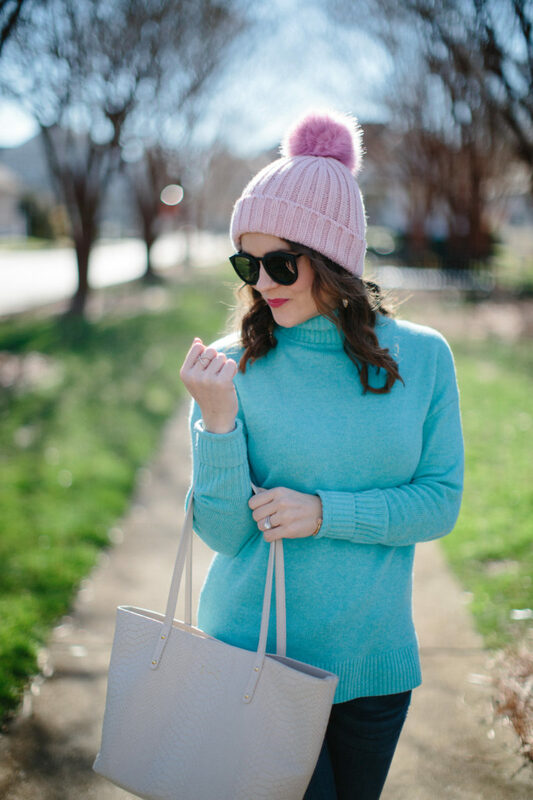 Digging this pink and teal combo here. They work so well together! This color combo is so pretty. I’m in love with this beanie! The color of that sweater is gorgeous. It looks stunning on you. Glad your move is going smoothly. 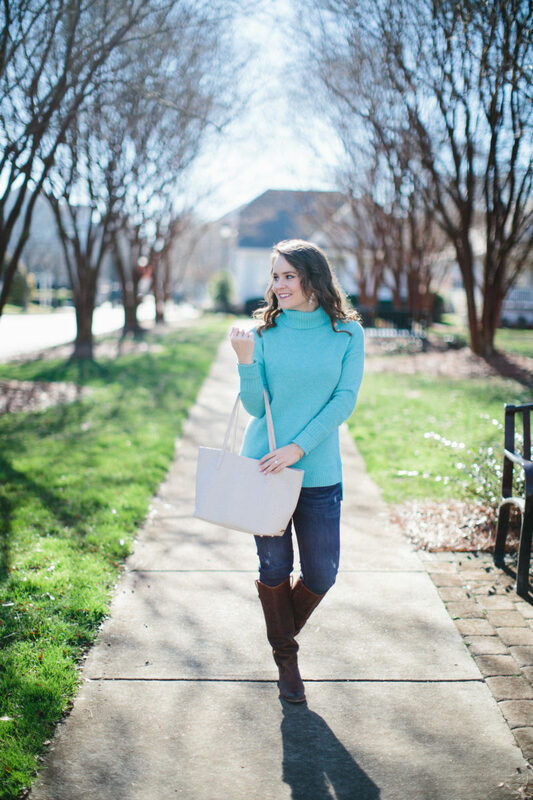 The color of this sweater is perfection on you! Love that beanie, too! Cutest color combo ever! What a cute outfit! Love your beanie! 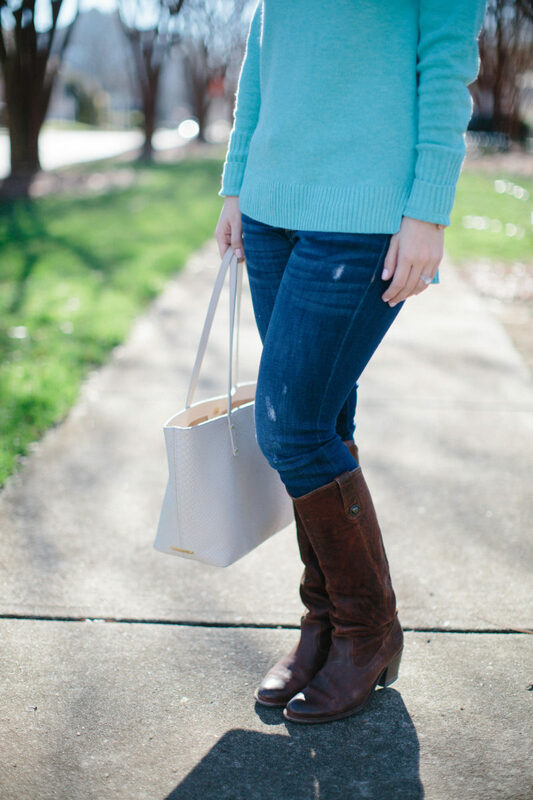 Such a cute, casual look! 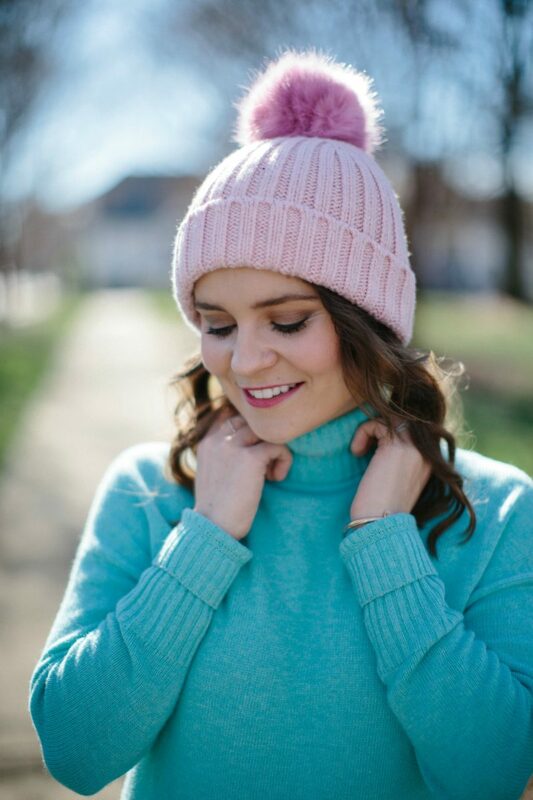 I looooove the pom pom beanie! So cute and effortless. Hats look weird on me for some reason. Wah. That beanie is too cute! I love pink and mint together! 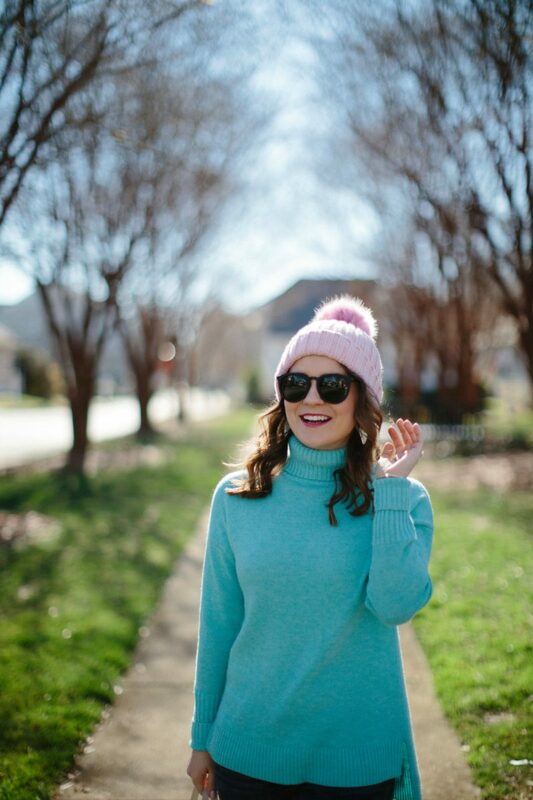 Love the pom pom hat and the sunglasses. That sweater color looks amazing on you. I also just realized Nashville was back on. I have some serious catching up to do as well. These colors look stunning together! I love a good bright color combo in the winter months. I love that sweater!! 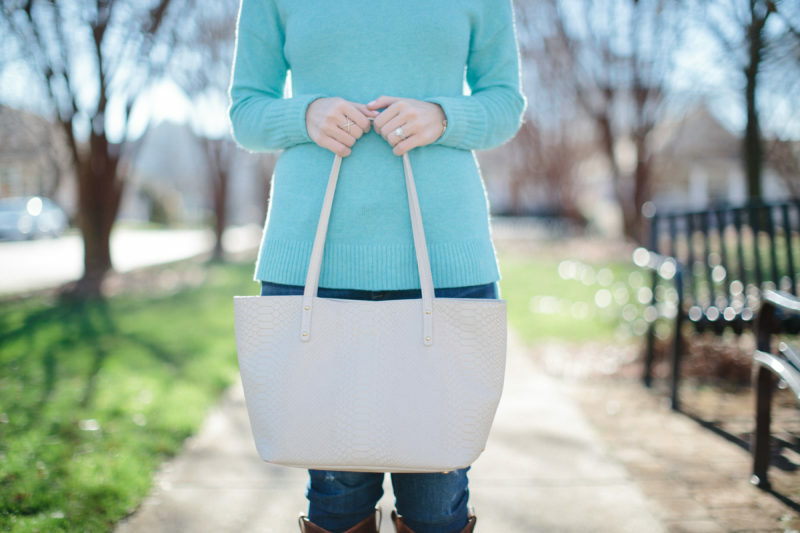 My favorite sweater is in that hue and it’s just gorgeous!! Love the hat, too!! I’ve got a similar Betsey Johnson one for this winter… and the pompom on the top makes me so happy.